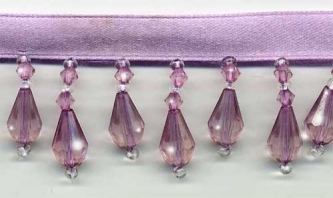 From our Beaded Drop Collection: This pretty beaded trim has soft lavender faceted teardrop beads with seed beads in crystal clear. A very pale, very soft shade of purple. This is a high quality, very full beaded fringe with exceptional detail and craftsmanship. The longer beaded stands are 1" long, not including the lilac satin ribbon.